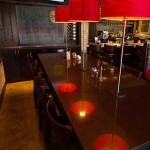 The new Brixx Wood Fired Pizza in Hoover, Alabama, features Solid Surface and Quartz surfaces fabricated by Surface One. 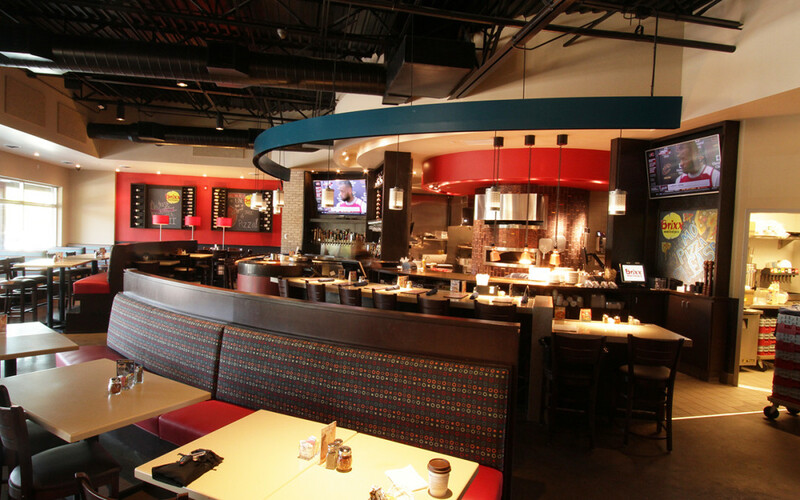 Surface One recently installed the surfaces for the new Brixx Wood Fired Pizza located at Patton Creek in Hoover, Alabama. 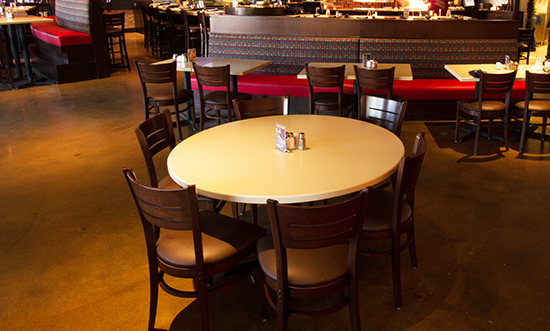 Brixx Wood Fired Pizza uses fresh ingredients to make pizza dough, meatballs, hummus and other featured items from scratch everyday. It is a family friendly restaurant that serves high quality sandwiches, salads and gourmet pizzas cooked in a wood fired oven. There are several different custom fabricated surfaces showcased within the restaurant, including Zodiaq Quartz and Corian Solid Surface, both manufactured by DuPont. 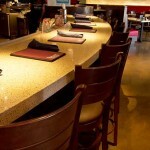 The long curved bar top is custom fabricated Zodiaq Quartz in the color Savory. Savory is a mixture of translucent stones within a mocha base. This extraordinary rich color with three-dimensional flecks coordinates beautifully with the Saddle Brown Zodiaq Quartz featured on the round serving area on the bar. Saddle Brown is a contemporary color that is luxurious and rich in tone. The Saddle Brown Zodiaq Quartz is also featured on some of the tables in the bar area. 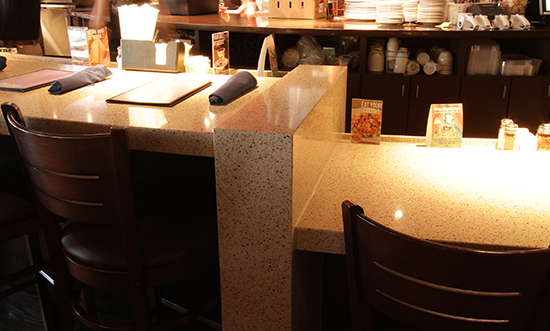 Quartz surfaces deliver strength and are heat and scratch resistant. It is an excellent surface material for food service and high traffic areas because it is stain resistant and bacteria resistant. Add to that the timeless beauty of quartz crystal and this material is an obvious selection for businesses as well as residences. The sparkling crystal within the Zodiaq surfaces are visually striking and utterly unique. The custom fabricated tabletops in the dining area feature DuPont’s Corian in Rafia. The warm, yellow-based neutral color is reminiscent of straw with randomly spaced translucent particles. 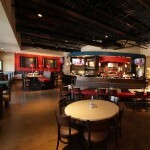 This rich color complements the other surfaces and the contemporary restaurant decor. Corian solid surfaces deliver high performance that is necessary in a restaurant environment, and incorporate outstanding aesthetics. The Surface One team is highly experienced in custom fabrication techniques for high quality design needs. 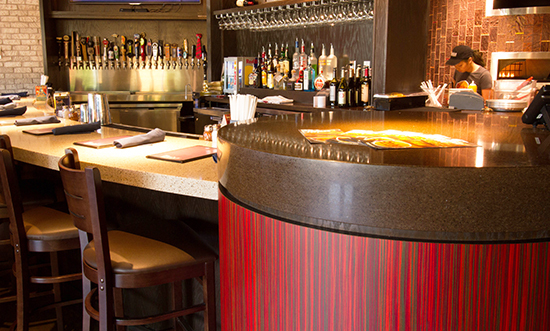 The surfaces in the Brixx restaurant feature complex radiuses and circular tops. 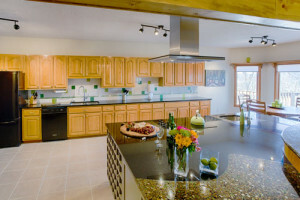 The surfaces also feature an even more complex laminated edge that ranges from 3” to 6” thick. Custom fabrication techniques were also used on a half wall within the restaurant that is clad in Quartz. These sections were mitered together to create a seamless appearance that adds to the design impact. Go Green with Vetrazzo Recycled Glass Surfaces! Surface One has found their clients enjoy earth friendly Vetrazzo because it is comprised of eighty five percent recycled glass and features unique colors and patterns not found in other surfaces. Vetrazzo offers ultimate style flexibility, allowing you to choose the pigments and glass for a custom counter uniquely tailored just for your kitchen or bathroom. This exquisite surface material is truly a work of art. Made of recycled glass and a binder of 15% modified Portland White Cement, additives, pigments, big bright chunks of glass and other recycled materials, Vetrazzo is the choice of many homeowners and commercial businesses. Guilt-free, more than 75 percent of the content in Vetrazzo is from post-consumer recycled content, keeping waste out of landfills. Combining glass and cement, both stout materials, produces a durable life expectancy of 50 years or more. 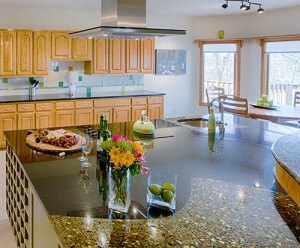 Vetrazzo is comparable to granite in strength, resisting both heat and scratches. The top is durable enough for the abuse of hot pans and cutting, after all…it is just concrete and glass! Make it the centerpiece for your home or space. High glass content with plenty of sparkle and expansive color palette make it a favored preference. 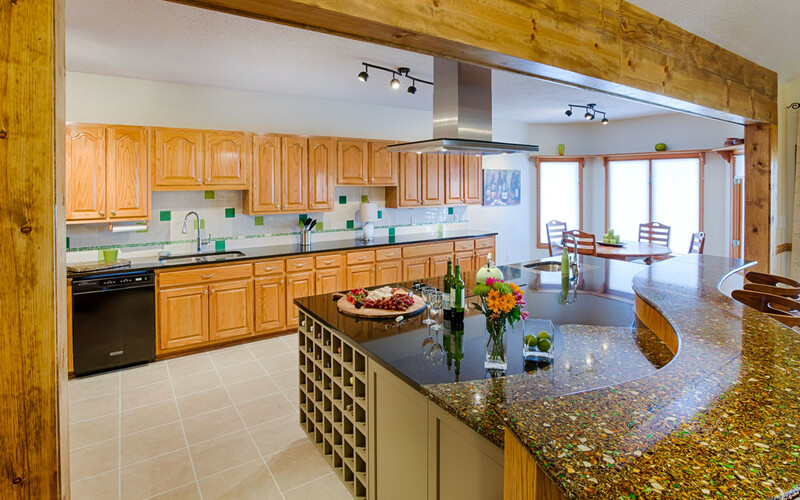 The recycling process and the variation in the glass source make the color, pattern, size, shape and shade that cause each counter top to be exclusive. From architectural to art glass, to beer bottles and jars, each mix is a signature blend of color and each surface has a story to tell. The Palladian Gray glass in the inlay used in this featured home is manufactured with glass from windows and doors from demolished buildings. Some other fun and beautiful colors offered by Vetrazzo include Alehouse Amber made of recycled beer bottles and Cobalt Skyy made of recycled Skyy Vodka bottles. Surface One is a leading source for custom fabricated surfaces that uses state of the art equipment to fabricate complex curves and shapes, like the featured inlaid granite and Vetrazzo. The design team at Surface One enjoys meeting with clients to find the perfect selection for each individual space. Bring your ideas and wishes for your kitchen, baths, offices, and outdoor living areas and watch your dreams become reality!